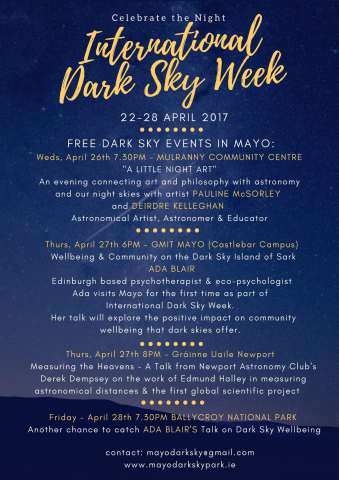 To celebrate International Dark Sky Week 2017 (22-28th April) there are lots of events planned in the Mayo Dark Sky Park area. Exciting events are taking place in Newport, Mulranny and Ballycroy throughout the week and hopefully we will see you there. Description: A talk from Newport Astronomy Club’s Derek Dempsey on the work of Edmund Halley in measuring astronomical distances & the first global scientific project.